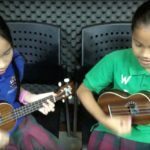 In Music, Year 4 have recently been developing instrumental skills on the ukulele, looking at strumming patterns, chord shapes and chord progressions! 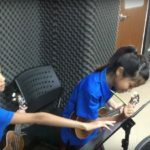 The children started playing the ukulele as a whole class, beginning with easy chords, such as Am, F and C, and working up to Em, G and D. Activities included call and response, which helps to develop rhythm and listening skills, as well as chord jams, to build confidence and familiarity with each new chord. 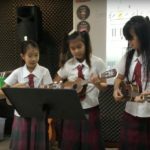 They also learnt and performed some specially composed songs, to help them start putting the chords together. These included The Bullfrog Blues, The Funky Fish and The Reggae Rhinoceros. 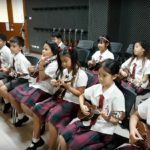 Following these performances, the children then started to work independently in pairs and small groups, using their new knowledge of chords and strumming patterns, to compose and perform their own pieces of music. 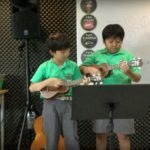 They showed fantastic teamwork, reflection and determination and had great fun sharing their music with the rest of the class!